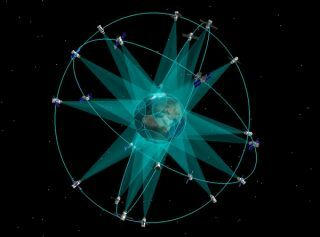 Artist's depiction of Russia's Glonass constellation of navigation satellites. Russia successfully launched a Soyuz rocket Friday (April 26) for the third time in less than a week, deploying a satellite to sustain the country's Glonass navigation network and extend the system's global reach. The launch came on the heels of two other Soyuz rocket flights. A Soyuz booster on April 19 launched a recoverable satellite with dozens of small animals for biological research pursuits, and another Soyuz rocket blasted off April 24 with a Progress resupply craft bound for the International Space Station. Friday's Soyuz flight, which originated from the Plesetsk Cosmodrome in northern Russia, was also the second space launch worldwide in about an hour. China delivered a payload of four satellites to orbit with a Long March rocket just before the Soyuz rocket took off from Russia at 0523 GMT (1:23 a.m. EDT), or 9:23 a.m. Moscow time. The Soyuz 2-1b rocket, launching with a modernized digital control system and an upgraded third stage engine, was swallowed by low clouds over the Plesetsk Cosmodrome moments after liftoff. The three-stage launcher released a Fregat upper stage and the mission's Glonass M satellite passenger less than 10 minutes later. Three firings of the Fregat main engine injected the Glonass satellite in a circular orbit about 12,000 miles (19,312 kilometers) high before separating the 3,119-pound (1,415 kilograms) spacecraft at 0855 GMT (4:55 a.m. EDT), or 12:55 p.m. Moscow time. "The first communication session has confirmed that the spacecraft is operating as designed, its mechanical systems deployed, sun and Earth acquisition completed successfully," said a statement issued by ISS Reshetnev, the Russian manufacturer of the Glonass M satellite. Operated by the Russian military, the Glonass system broadcasts navigation signals to Russian military and civilian users around the world. It is Russia's counterpart to the U.S. Air Force's Global Positioning System. The Glonass constellation is scattered among three orbital planes, each designed to contain eight satellites to maximize coverage around the world. Russia initiated a satellite replenishment program to mend the fragmented Glonass fleet after a funding crisis in the 1990s rendered the Soviet-era program unable to provide even limited coverage of Russian territory. As of April 25, the Glonass system included 23 operational satellites, plus two spacecraft undergoing in-orbit maintenance, three orbital spares and a satellite in testing, according to Roscosmos, the Russian Federal Space Agency. Friday's Soyuz launch of another Glonass M satellite restores the fleet to 24 operational satellites, the number required to achieve global navigation service. Russian officials, speaking to the Novosti news agency, said the new craft will enter service after a few weeks of testing. The Glonass M satellite model is designed for seven years of operations.